Just half a year from now, Simon & Schuster will publish my young readers edition of the most important scientific book ever written. I was twenty-three, an earnest grad student in English, when I first read Charles Darwin’s On the Origin of Species. 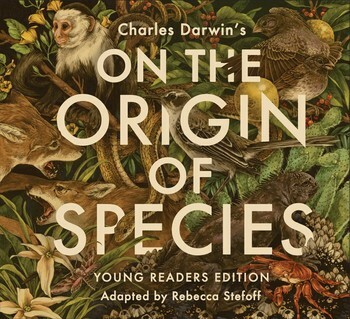 In the years that followed, as my nonfiction writing career took me deeper into writing science books for kids, I reread the Origin several times, alongside many more recent works on natural history and evolutionary biology. So once I’d published YA adaptations of books by Howard Zinn, Jared Diamond, and others, it was perhaps inevitable that I’d think, “What about Darwin?” And here we are. This entry was posted in Darwin, Evolution, Nonfiction, Publishing, Writing and tagged Darwin, Evolution, Nonfiction, Origin of Species, Publishing, Writing on March 4, 2018 by Rebecca Stefoff. Years ago I wrote a book called Scientific Explorers. It was the third volume in my Extraordinary Explorers YA trilogy for Oxford University Press, and it contained a chapter on Darwin, one that I was happy to see drew special praise from several reviewers. I went on to write a YA bio, Charles Darwin and the Evolution Revolution, also for Oxford; it remains in print, twenty years later. 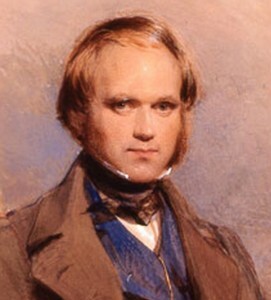 Since then I’ve written a number of children’s and YA books on subjects related to Darwin’s work and to evolutionary biology, including a four-volume series for high-school-age readers on human evolution. I also recently adapted Jared Diamond’s book on human evolution, The Third Chimpanzee, into a version for young readers. It was published in North America by Seven Stories Press and has been picked up by a dozen or so foreign publishers as well. This new project, adapting Darwin’s own words for kids–while keeping as many of them as possible just as he wrote them, and adding sidebars to bring the science up to date–feels like the culmination of a long history of engaging with Darwin and his world-changing achievement. It also feels like an enormous responsibility. Stay tuned for updates as I strive to meet the challenge. This entry was posted in Darwin, Evolution, Nonfiction and tagged Darwin, Evolution, Nonfiction on June 23, 2015 by Rebecca Stefoff. I wish the sales department had included in the catalog copy something along the lines of “Prepared with the assistance of paleoanthropologist Ian Tattersall and molecular biologist Rob DeSalle of the American Museum of Natural History . . . .” One of the greatest pleasures of writing this series was having those heavy hitters review–and, best of all, like–my manuscripts. And my trusty publisher did a wonderful job on the production values; the books are gorgeous. This entry was posted in Evolution and tagged Evolution on September 16, 2009 by Rebecca Stefoff. Sometimes my job is really fun. I’m working in overdrive tonight to finish the fourth and last ms. in my YA series on human evolution. The last chapter in the book is about “The Peopling of the World.” In it I discuss the extremely contentious topic of when humans first arrived in the Americas. I’m including a short sidebar about a remarkable piece of evidence found within the last few years right here in Oregon: human coprolites–that is, dried-up turds–that have been radiocarbon-dated to 14,300 years ago. They are pre-Clovis. They are, in fact, the oldest datable, tangible human remains (as opposed to indirect signs of human presence) yet found in the Americas. This entry was posted in Evolution, Nonfiction and tagged Evolution on November 24, 2008 by Rebecca Stefoff. I went outside fairly early this morning to water the front garden. All of the plants and even trees needed it because of the sudden and severe heatwave that has afflicted the Pacific Northwest. After high temperatures that were well below seasonal averages for most of the past few months, we’ve had several consecutive days of record-setting highs. 95 on Friday–gah! Fortunately it is supposed to cool down tomorrow. At the edge of our driveway I spotted one of the largest slugs I’ve seen in a long time, almost as long as my hand (fingers included) and robust, to boot. I find these guys fascinating; I watched it for a while and was happy to see that it was making its way at what might have been top slug speed off the concrete and toward the moist ground cover. On one of the flagstone paths lay a small (significantly smaller than the slug) common mole, paws up, bearing no sign of violence or trauma, dead as a doornail. A lot of people despise these little insectivores. Perhaps, if I had a grass lawn, I wouldn’t be as fond of them as I am (a legacy of The Wind in the Willows?). But among our untidy masses of perennials and ground cover, the moles’ activities are neither unsightly nor irritating, and it’s fun to watch Xerxes stick his paw hopefully, but always in vain, down their holes when I take him out for walkies. Anyway, I buried the corpse at the side of the path, partly because it just seemed weird to see a mole aboveground and partly so that Xerxes won’t try to play with it later when we go out. Its fur, by the way, was astonishingly soft and silky–hence, I suppose, moleskin. On another front, Zach has been in Italy since Wednesday morning and will return on the 29th. I am making good use of my precious solo time to get a lot of work done on the Human Evolution series. I’ve settled a number of organizational questions and have put together what I think is a first-class set of back matter (glossaries, time lines, “further reading” lists of good books and Web sites, etc.). These procrastinatory tactics aside, I am actually well into the writing, with every expectation of turning in the first two mss. by Zach’s return. Of course, I’m not doing much of anything but work, but that’s fine. It makes up for all the stretches of time when I do so little of it. This entry was posted in Evolution and tagged Evolution on May 18, 2008 by Rebecca Stefoff.